You do not have to start from scratches every time when developing your content strategy. Instead, it makes sense to repurpose your successful static content that you have already published or posted on your site and turn into an engaging and interesting interactive format. Here, we present to you 5 basic but major ways your small business can convert the best parts of your static content published on your blog or your site, to make it interactive and interesting for your users. There are many others who have already explored the advantages of interactive content to completely rebrand small business, and so can you by simply following the below mention easy steps . 1. Repurpose Existing Assets – No matter how much time, money and efforts, you invest in sourcing a custom website design and building a comprehensive blog filled with great write-ups, infographics, articles, etc. from scratches, your static content wouldn’t excite your readers for long, especially if your content assets are unchanged for a very long time. Just repurpose your existing content to ensure that your target audience can actively interact with your content. So if you have some useful blogs, turn them into quiz and calculators to make things exciting for users. For example, your health blog can allow people to calculate calories from foods. Hubpost.com reveals an ocean of information on the purpose of repurposing content. Likewise, you can repurpose your infographics into interactive infographics to ensure truly imaginative and entertaining experiences for your users. Make your white papers interactive and turn your images into an interactive gallery. 2. Prefer Timeless Content – When selecting the type of static content for repurposing, prefer evergreen content to ensure quality experience for your users. Find out which of your content had the highest click-through rates and was shared the most on your social media platforms. Remember, the static content that has garnered likes and shares is the ideal content to be transformed into an interactive piece for greater impact. Usually, netizens are more interest in tips and tricks, how-to posts, case studies and a host of other related evergreen topics. It makes sense to just tweak the facts in such pieces and repurpose it for users’ sharing. 3. 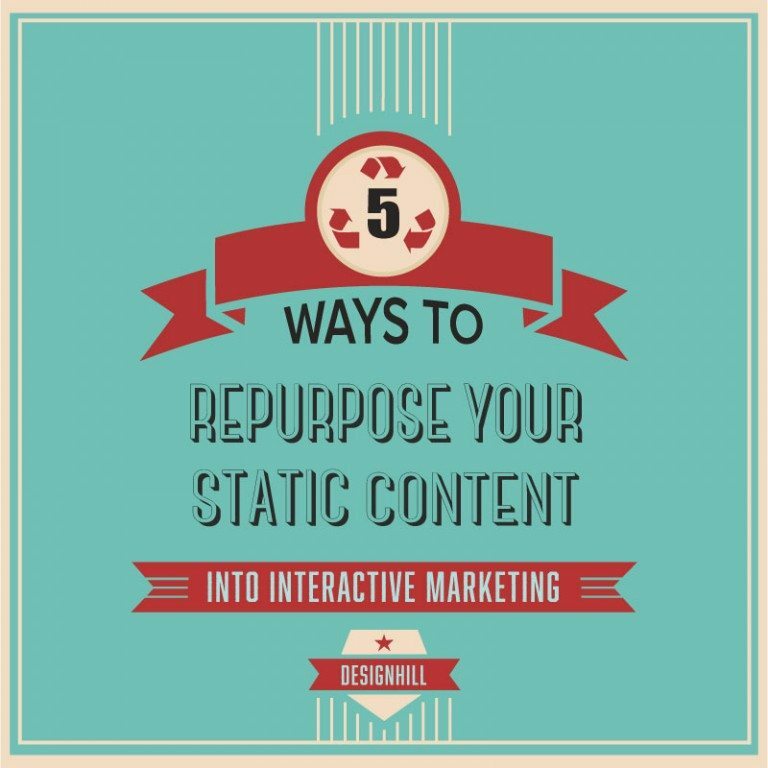 Know the Intention – Why do you want to repurpose your static content? A reason could be that you need to engage people more with your blog or website and its business. Or, you may wish to create content that stands out. Generally, companies use interactive content to generate quality lead. SnapApp.com, for example, reveals that Bizo created 400 leads in over 90 days with 15 different interactive campaigns. Yet Another classic example of interactive content with a purpose is of University of California, Berkeley. The Berkeley university used interesting interactive quizzes to make its content look unique and aptly connect with its target audience. 4. Select Facts Only – To repurpose your content, make sure that you do not select more than 20 percent of your text, advises snapapp.com. Also, select only the facts and actionable items that yield enough power to interest your target audience. Also, make sure that the static content you choose for repurposing is relevant and significant for your target audiences. 5. Enjoy the Benefits – After you have reshaped and repurposed your static content by making it interactive, do well to reap the benefits for your small business. Collect as many leads as possible, let your users subscribe to your website or blog, ask your users to share your interactive content and allow them to embed or download your interactive content for utmost impact. These tips will help you revitalize your static content to avail loads of benefits and advantages including better SEO results, substantial increase in network traffic, ease in conveying business message, effective lead generation and an effective brand differentiation for your small business brand in the ever-so-competitive market. Would you like to learn more about interactive content and how it can be leveraged to attract high-quality leads and convert them into customers? Download a FREE copy of our latest White Paper – The Ultimate Guide to Interactive Content for Small Businesses.